Ajahn Nyanadhammo discusses the final few weeks of the life of the Buddha including his final teachings, and his final passing away (parinibbana) as told in the Mahaparinibbana Sutta. Ajahn Nyanadhammo gives a talk around a teaching given by the Buddha in which he answers 10 questions which are central to the search for meaning. Ajahn Nyanadhammo discusses how to set up the mind in meditation. Ajahn Nyanadhammo offers advice on decision-making; how to make judgement based on what is right and wrong; and direct our lives in a way which is skillful and beneficial. To do this we need to develop the inner spiritual qualities (bhavana) of tranquility and wisdom. Ajahn Nyanadhammo shares with us with talk with numerous tales of psychic phenomena from his time in Thailand. The reasons why being still in meditation can be challenging, is because of one (or more) of five things: sensual craving, ill-will, slothfulness, restlessness and doubt. Ajahn Nyanadhammo explains what the Five Hindrances are and how to overcome them to attain tranquility and insight. Ajahn Nyanadhammo talks about the process of dying and what lay beyond the death of the body. Ajahn Nyanadhammo talks about the development of the Ten Paramis (a.k.a. ‘perfections’, ‘virtues’) in a way that connects with contemporary life. Most people in the world want action and stimulation. Peace and stillness seem very boring to most people in the world. But in the peace and stillness of meditation very powerful and profound things can occur, just as when Siddhartha Gotama sat in meditation under the Bodhi tree at Bodh Gaya and freed his mind from all traces of suffering and illusion. Ajahn Nyanadhammo talks about how the seemingly ordinary acts are where we can find the path to awakening. Ajahn Nyanadhammo reflects upon the importance of developing wisdom in life so that the results of the actions that we sow today are pleasant and not painful, and so that we can develop the path of practice. Ajahn Nyanadhammo gives a talk on speculation (in Pali 'papanca') and how it ties up so much of our mind's effort, and yet so rarely correlates with reality - and so often gets us in to trouble! 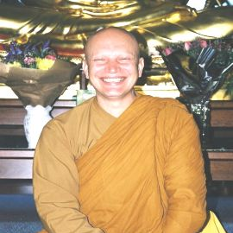 Having just injured his foot by taking short cuts, Ajahn Nyanadhammo gives wise advice on the perils of trying to take "short cuts" on the Eightfold Path to Awakening, and how those perceived short cuts often end up being the long way around for those that attempt them. In the long run, the fastest route on the spiritual journey involves patience and persistence in developing the spiritual qualities that lead to liberation. Ajahn Nyanadhammo offers advice on decision-making; how to make judgements based on what is right and wrong; and direct our lives in a way which is skillful and beneficial. To do this we need to develop the inner spiritual qualities (bhavana) of tranquillity and wisdom. Ajahn Nyanadhammo shares us with talk with numerous tales of psychic phenomena from his time in Thailand.